Like I did post here before, I should keep you updated on more information about backstage Harry Potter information and that there would be news today, and well here it is! Warner Bros has launched the official website and details on their Harry Potter Leavesden tour of the Harry Potter film sets, (opening Spring 2012) called Warner Bros. Studio Tour London – The Making of Harry Potter. Warner Bros. today unveils plans for the Warner Bros. Studio Tour London – The Making of Harry Potter. This unique walking tour will give visitors the chance to go behind the scenes of the most successful film series of all time and witness the intricate detail that goes into a working set to see first hand what the camera doesn’t show. The announcement was made by Dan Dark, SVP & Managing Director, Warner Bros. Studios Leavesden. Warner Bros. 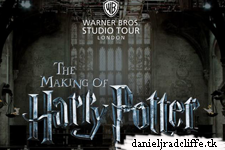 Studio Tour London - The Making of Harry Potter will open in the Spring of 2012 at Warner Bros. Studios Leavesden, the production home of the Harry Potter films for over ten years. Tickets will go on sale later this year and must be booked in advance via a dedicated website www.wbstudiotour.co.uk or through approved tour operators. Featuring the authentic sets, costumes, animatronics, props and effects used in the production of all eight Harry Potter movies, the tour will showcase the British artistry, technology and talent that went into bringing this beloved film series to life. Among a series of never-before-seen exhibits on the three hour long tour, visitors will be able to walk onto some of the most memorable sets from all of the films in the Harry Potter series including the iconic Great Hall, Dumbledore’s office and many others to be announced at a later date. One of the first sets ever to be created for the series, the Great Hall was built in 2000 for the series’ first outing, Harry Potter and the Philosopher’s Stone. Designed by BAFTA-winning production designer Stuart Craig, it is 120ft long by 40ft wide with a solid stone floor and includes the tables and benches used in the films. Dumbledore’s office, meanwhile, was built for Harry Potter and the Chamber of Secrets and is also the home of the Sorting Hat, The Sword of Gryffindor and Dumbledore’s desk which is surrounded by a library of ancient looking books. Adorning the office walls is a myriad of paintings commissioned specifically for the films, including two of Professor Dumbledore himself. Tickets will go on sale at a date to be announced later this year, but interested guests are encouraged to visit www.wbstudiotour.co.uk and register to receive ongoing updates and information on Warner Bros. Studio Tour London – The Making of Harry Potter. Currently under construction, Warner Bros. Studios Leavesden is set to be one of the largest studio production facilities in Europe when it opens next year. A quarter of a million square feet of dedicated soundstages, and the largest back-lot in Europe, will accommodate major film, TV and advertising productions within its secure 200 acre state of the art site in Hertfordshire. Warner Bros.’ relationship with the site stretches back over ten years, and has seen the production of all eight Harry Potter films as well as many other recent Warner Bros. films including Christopher Nolan’s The Dark Knight and Guy Ritchie’s Sherlock Holmes and the forthcoming sequel Sherlock Holmes: A Game of Shadows.